The Flash SWF file is one of the most favoured types of media files for digital signage. Sothink offer a range of products designed to create or manipulate SWF files. SWF Easy is the entry-level software for the creation of swf files for digital signage. It offers drawing tools such as Line, Pencil, Pen, Oval and Rectangle and advanced editing tools such as Transform and Reshape . 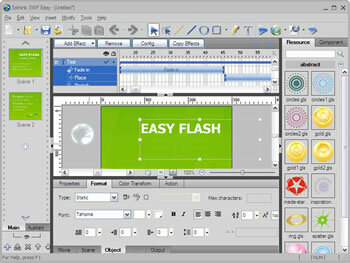 SWF Easy has 60+ animated Flash effects with the ability to combine separate effects into numerous new effects. The user has the option to adjust effect duration simply by drag and drop and loop effect is supported. SWF Easy is suitable for users with little knowledge of graphics creation. SWF Quicker is an advanced media content creation software that supports a diverse range of file formats for import and output. Importable media types include AI, MP3, MPEG, AVI, MOV, AVI, MPEG, WMV/ASF, MOV/QT, RM/RMVB, DivX/XviD, etc. Export formats include SWF(including 10.0), EXE, GIF, AVI and Flash Lite (2.0, 2.1, 3.0). SWF Quicker includes a full set of vector drawing tools, such as Rectangle, Pen, Brush, Eraser, Paint Bucket, etc and is suitable for the advanced user. SWF Decompiler is a leading Flash decompiler and Flash to HTML5 converter. The software converts SWF to FLA, SWF to FLEX and easily extracts Flash resources like shape, image, sound (mp3, wav), video (flv), text, sprite, ActionScript, etc.